1st day: After a short stop at the Corinth Canal drive to Epidavros (visit of the archaeological site and the Theatre of Epidaurus, famous for its acoustics) and then on to Nafplion for the night. The afternoon is at leisure to explore this charming old town. Dinner and overnight in Nafplion. Please note that from Monday afternoon until Tuesday midday there won't be any guiding. 2nd day: Departure round 12:30 to Mycenae where you will visit the archaeological site and the Tomb of Agamemnon. In the afternoon, departure for Olympia through central Peloponnisos. Dinner and overnight in Olympia. 3rd day: In the morning visit of the archaeological site of Olympia, including the Temple of Zeus, the Temple of Hera, the altra of the Olympic flame, the Stadium and the museum. Departure from Olympia to Rion, cross the Corinthian bay over the amazing suspended bridge to Antirion. Drive by Nafpaktos, along the coastal road to Delphi. In the afternoon, visit the picturesque but also quite cosmopolitan village of Arachova. Dinner and overnight in Delphi. 4th day: In the morning visit of the archaeological site and the museum of Delphi. Drive to Kalambaka through Amphissa, Lamia and Trikala. Dinner and overnight in Kalambaka. 5th day: In the morning visit of the breathtaking Meteora and in the early afternoon drive back to Athens. The bus was new and immaculate. 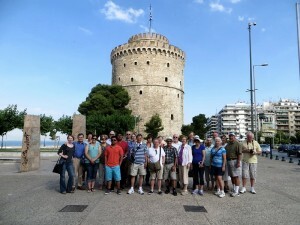 The guide we had for the last four of the days, Antonis, was very knowledgeable and also warm and entertaining. Hotels were clean. Overall very pleased. very well organized. Hotels ranged from excellent (nafplio) to very good. Our tour guide, Mr. George was a poet and a font of information. I don't usually take guided tours because I don't like to be herded, but this one wasn't hard to get used to, and the benefits outweighed my innate reluctance to be with so many people. Would happily do this again so as to be able to cover all that ground in one trip. Gives you a nice taste of what is there so that perhaps in the future I can go back and enjoy being there on my own. My wife and I enjoyed this tour. Our tour guide, George, was excellent. We enjoyed the tour and our tour guide was very informative. Overall Outstanding! We visited very interesting sites and our tour guide - Antonio was awesome!!! I was disappointed in the "A" class hotels. Buffet food, somewhat rundown facilities. Thank you for your feedback, we appreciate your taking the time to send us your comments. We are glad to hear that you enjoyed your tour despite the minor deficiencies of the hotels. We will make sure all your comments are received by the operator. We look forward to welcoming you to Greece again in the future. the "Classical 5-day Tour with Meteora"